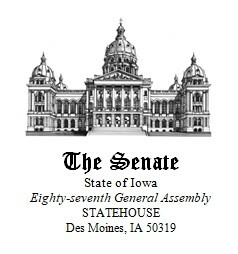 The bill mandates employees newly hired on or after July 1, 2019, who would otherwise be members of the public safety peace officers’ retirement (PORS), accident/disability system, the Iowa public employees’ retirement system (IPERS), the statewide fire and police retirement system (411), or the judicial retirement system, SHALL NOT become members of their respective retirement systems. These are all state defined benefit pension plans. The bill directs each retirement system to submit a plan to create an alternative defined contribution plan to the public retirement systems committee by October 1, 2018. This is a bad bill – built on a bad idea. While Senate File 45 would get rid of all public defined benefit pensions, this year most discussion is on the IPERS pension system. IPERS is 82.4 percent funded, which rating agencies say is like being an “A” student. While some public worker pension systems in other states are in bad shape, Iowa’s system was ranked as the 10th best-positioned pension system in the country. Iowa also has the 4th lowest debt, including pension liability, in the country. One in 10 Iowans is a member of IPERS. Most of IPERS members are teachers and school staff, followed by law enforcement, social workers, prison staff, transportation workers, and other public employees. The average IPERS retiree leaves public employment after 22 years of service. The average IPERS retiree receives an annual benefit of $16,000. Benefits are calculated based on a formula of years of service and highest average salary, with a maximum benefit of 65 percent for 35 years or more of service. No one makes more in IPERS retirement than they did while they were working. This benefit is secure and paid for a lifetime, but does not include a cost-of-living adjustment. Every year spent in retirement means the IPERS monthly benefit has less buying power. That’s why IPERS is only one part of retirement planning and is designed to be combined with Social Security and other personal savings and investments. 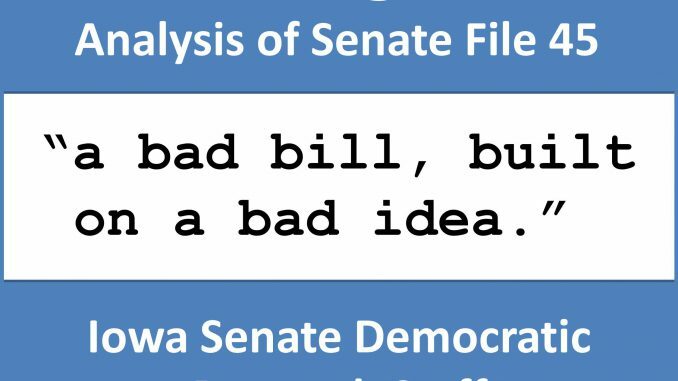 While SENATE FILE 45 did not advance in the 2017 – 2018 session, leading Iowa Republicans continue to back the ideas contained in the bill. On April 24 of 2017, shortly after the 2017 session adjourned, Governor Reynolds told reporters that her priorities for the next session included “Water quality, tax reform and a study of the Iowa Public Employees’ Retirement System,” according to reports in the Cedar Rapids Gazette and the Quad City Times. On December 18 of 2017, the Legislature’s Public Retirement Systems Committee met for a contentious meeting, headlined by one newspaper as: “Iowa lawmakers grill IPERS officials about public pension funding.” The committee adjourned without making recommendations for legislation in 2018. On June 22 of 2018, Governor Kim Reynolds was interviewed on Iowa Press (http://www.iptv.org/iowapress/story/30878/governor-kim-reynolds). The Governor repeatedly talked of making changes to IPERS while “maintaining the commitments that have been made.” IPERS managers have consistently warned that changing to a 401(k) plan for new members would threaten benefits to current members. On October 23 of 2018, individual editorials from Governor Reynolds and Iowa House Republican Speaker Linda Upmeyer appeared in major papers. Both claimed there are no plans to change IPERS.